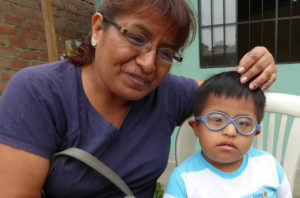 In Peru, MMI’s Community Health program provides access to allied health services for children with a disability living in poor and underserviced communities on the outskirts of Lima. Andrea Diaz and her son, Daniel, who has Down Syndrome, are able access therapies that would normally be out of reach due to costs. Andrea’s wish, like any mother, is for Daniel to be independent. Andrea is already seeing improvement, with Daniel slowly starting and wanting to speak. Being able to utilise previously unattainable therapies has given Andrea hope for Daniel’s future and has given hope to many families, who are now, due to your generosity, able to access essential services for their children. “I would like to see more hearing impaired children attend school like any other children… I very much appreciate your support”. 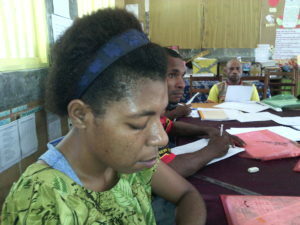 In Papua New Guinea it is estimated that 15% of the population have a disability and face significant physical and social barriers, with only 2% receiving adequate services. MMI’s Inclusive Communities Program, in partnership with Callan Services Vanimo, aims to increase access to education and health services in remove villages and to raise awareness of the rights of people with disabilities. Ethel Wahlen is 19 years old and is hearing impaired. She lives with her three sisters and two brothers in Waromo and enjoys cooking. Recently Ethel participated in the Community Based Rehabilitation (CBR) Volunteer program. Being engaged as a Volunteer by Callan Services, Ethel’s self-esteem has risen, empowering her to become a disability advocate in her community,helping her break down barriers not only for herself but for others too.